Today I start introducing our new Spring-Summer 2013 patterns. These new styles should be available on our website by March 5 and at your local retailers around the world shortly thereafter. So without further ado, let me introduce you to the Roller Skate Dress + Tunic. This season I thought we could all use a dress pattern that would be like a blank canvas. 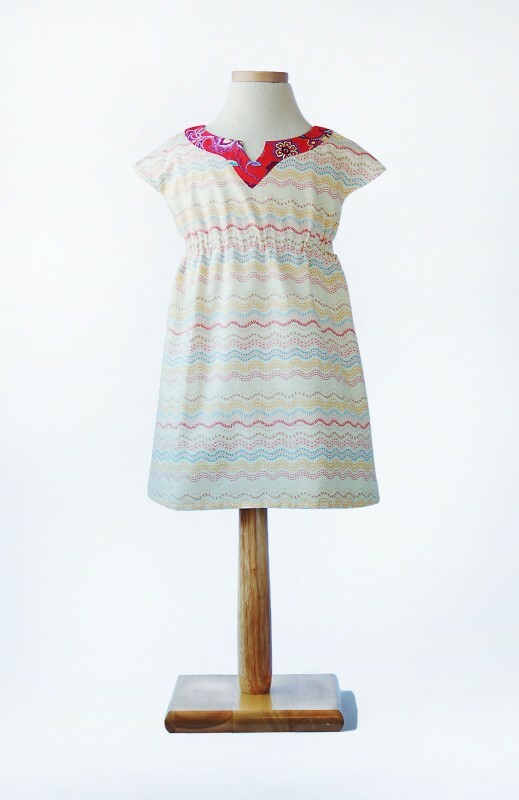 You know what I mean: a dress that you can make over and over again and still have lots of fun making and customizing. I wanted it to be a dress with really simple lines, not a lot of seams, and still enough interest that it could stand on its own as a great design that could be made many times and never get boring. The idea here is that this dress is simple enough that it can support really bold prints, can be embellished in all sorts of ways, can be made for everyday use as well as for dressier occasions, and will be a staple pattern that you’ll reach for time and again. I’m really pleased with the results and hope that you’ll love it too. This pattern is, for all intents and purposes, just two pieces. But it’s also a fully lined dress! Remember the Bubble Dress? This has the same built-in cap sleeve style that you like so much. So there’s no sleeve to set in or attach. And no buttonhole! We’ve designed the dress with an on-seam opening at the back and a button loop, so you won’t need to deal with any complicated closures. (Although I know you’ve getting really good at buttonholes and zippers. We’ve been thrilled at your response to those patterns and everything you tell us you’re learning from them.) It also has an enclosed elasticized empire waist, so it really is just as straightforward a dress as can be. Of course simple and straightforward is great, but what about the fun part? Well, my favorite part of this dress is the optional yoke (View B) that makes a really sweet neckline and gives you a chance to use a contrast fabric. The yoke is really easy to sew using our method. And we’ve included a cut line so you can make both versions of the the dress as a tunic, too. So we’ve already included four different looks in the envelope. But with just a few small changes you’ll find all sorts of options. You could easily lower the elastic casing for the empire waist for a different look. And if you cut the lining and the outside fabric the same length, the dress could very easily be reversible, so there’s a big option right there, for those of you who love reversible. Of course, we didn’t let it stand there. You know you can embellish your sewing a million different ways, right? In a few days I’ll show you how to make this version of the dress with little houses appliqued at the hem. I’ve been working up a template so you can reproduce this yourself, but I’ll also talk you through the process so you can design your own applique. We’ve just started carrying a couple of products that will make it really easy. We rated this pattern two scissors, but it’s an easy two scissors. I’m really excited to see what you do with this pattern, and I suspect you’ll be using it a lot. I know I am. Thank you, Thank you, Thank you for designing this pattern! It’s a silhouette that’s very similar to a lot of the RTW dresses my oldest likes so I’ll be able to use this for all of my girls. Can’t wait to get my hands on it! This is just great, Liesl!!! I can see all the advantages to this pattern as I read your introduction. Just what every busy sewist needs – a pattern that works with many different kinds of fabric, and is easy to make. Thank you, dear genius. Love love love it. Perfect simple shape. The last one with the houses – REALLY love! HOLY CUTENESS! I love this! Cannot wait!!! I have to admit that it was the “bubble dress” reference that got my attention first. I love that pattern (cap sleeves, of course) but unfortunately my daughter is out of its size range. PS. Can’t wait to know more about the cute applique. Looks wonderful. I usually take a few weeks to warm up to a new pattern. I wish I could start on this one today!! Just what I’ve been looking for! Thanks! I love it! We will use this a lot. YES! Can’t wait to try. So cute. It is simply adorable! Love the cap sleeves, and the possibility to play around with this pattern to really make it our own, or just leave it like that and still get the cutest dress. 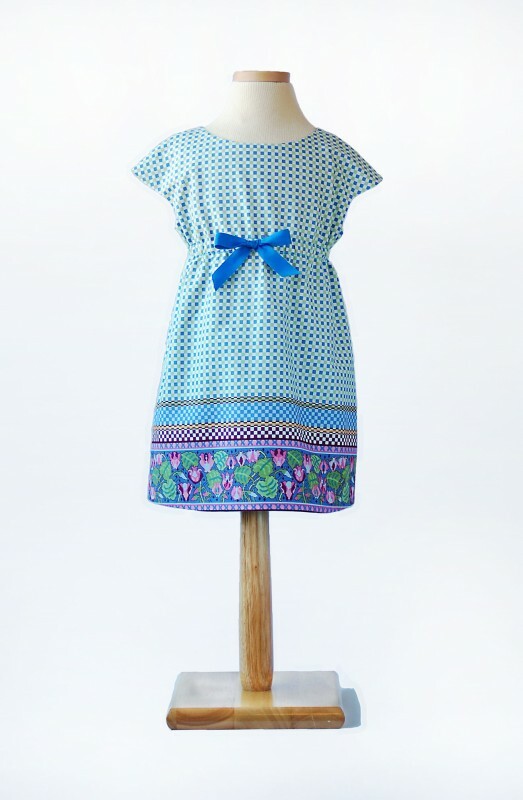 Thanks Liesl and the team for another wonderful Oliver+s pattern! I LOVE this! Thank you so much! Waiting on pins and needles until March! Liesl, it’s beautiful!! I showed it to my 3-yr-old who said, “You can make it for your girls!” 😉 I can’t wait. So perfect! So many possibilities, and the applique is to die for! March cannot come soon enough! Oh, I love it!!! And I love to appliqué. Perfect for my three girls(the bubble dress is one of my go to patterns). Can’t wait to see the rest!! I’m just in the mood for some simple projects right now and this is ideal! It’s a little like a modern take on a peasant dress, isn’t it? Which is versatile and classic. I can see this layered in colder weather too, just as the Ice Cream dress looks nice layered. I look forward to this and the others. LOVE this one! What a great pattern for Spring for my girls! I love everything about that version at the top. Can’t wait. yes!!! what a great, simple, fun design. i can see myself making this again and again…so many possibilities! Love, love, LOVE! I can see myself making this many, many times. 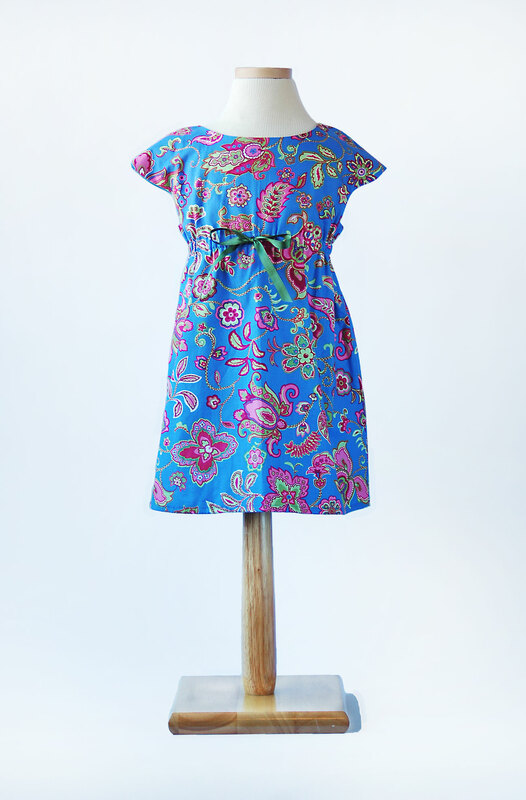 This is such a cute dress– can you make a matching pattern in misses sizing? I would love to make it for myself!! LOVE this so much!! Another beautiful pattern, Liesl! I have fabric chosen for Matilda,I hope I make it by her birthday…. I can just see this becoming a fast favourite in out house! Yet another fantastic pattern Liesl! Love this and can’t wait to get hold of the pattern! I’m on the bandwagon too! So many possibilities! What a great dress/tunic sewing pattern. This style will be perfect for many different prints of fabric. Looking forward to ordering. Thank you, Liesl. You’ve talked me into it. I only have boys, but this one sounds like it would be great to stitch up as a gift for my nieces and friends. This looks terrific! What sizes will be available? I’ll also put in another plug for reissuing the larger size bubble dress pattern (up to 10-12). Please, oh please?? I’ve graded the one I have, but my daughter keeps growing! Kristi, this will be released in sizes 6m-4 and 5-12. Unfortunately, we won’t be reissuing the Bubble Dress in larger sizes. We’re focusing these days on developing new product and just don’t have the time to go back and update older styles. I love it! I hope it will be available in digital form too. I am looking forward to seeing the full spring line of new patterns. I have had great success in making school uniforms and weekend dress from Oliver and S patterns. I would like a few more styles. I also desire some more boy patterns. My son gets jealous of his little sister. Anyway, great job with the pattern. Liesl, this is so beautiful – what a lovely style for so many different occasions. I can’t wait to make it for my girls – I love the capped sleeves and the two neckline options – just fantastic in every way! Oh so cute and so many possibilities! Love all the versions, but the fabric of the first one is stunning. Love that house one too! hello will this lovely pattern be available in digital format? Love this pattern and will be purchasing it shortly. Can you please tell me the name of the fabric you used in the top photo? My daughter loves it and would lie me to use it for a dress for my granddaughter. Betsy, I’m this fabric came from Mood Fabrics, here in New York. I purchased it quite a while ago and haven’t seen any there since I bought it, which usually means that they’ve sold it already. However, keep your eyes open for ikat stripes and you’ll probably find similar styles! A Google search might help, too. Ooh, my daughter just told me yesterday that a Mood fabric has opened just down the street from her in LA:) I will tell her to check there. Thanks! I’m a grown-up, but would really, really love to buy this pattern in my size. I think it’s a really lovely dress and also seems like it could be quilting weight cotton friendly – something quite rare.